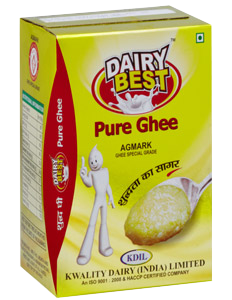 This is AGMARK certified pure ghee produced from fresh milk of excellent quality under utmost hygienic conditions using the most modern equipment. 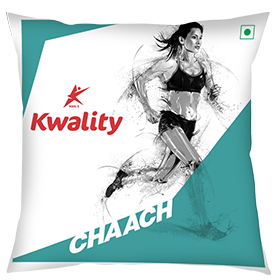 It has traditional granular texture which gives a rich & mouth-watering aroma. It contains plenty of antioxidants & vitamins. It stimulates muscle movements, strengthens the sense organ, nourishes the skin and provides energy. It can help in better digestion too. 9 months for poly pouch 12 months for RT, Tin, Jar & Bucket. 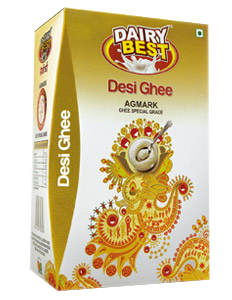 This is AGMARK certified pure cow ghee produced exclusively from fresh cow milk of excellent quality under utmost hygienic conditions using the most modern equipment. It has traditional granular texture along with yellowish appearance that gives a rich & mouth-watering aroma. It contains plenty of antioxidants & vitamins. It stimulates muscle movements, strengthens the sense organ, nourishes the skin and provides energy. It can help in better digestion too. 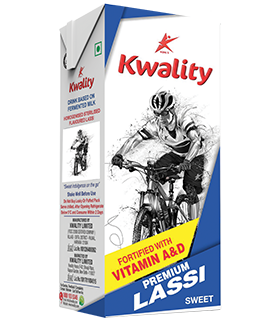 This revolutionary product has been proudly launched by Kwality Ltd. only. 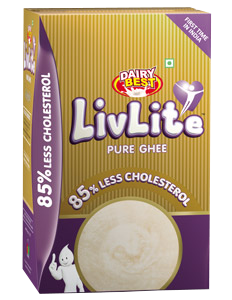 This is pure ghee with 85% less cholesterol content. 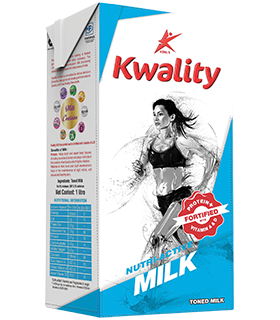 The technology has been developed & patented by National Dairy Research Institute(NDRI) Karnal of ICAR and licensed by National Research and Development Corporation (NRDC). The product has been patented for the company for ten years. Although fats and cholesterol are required to maintain overall health and normal body functioning, but high levels of cholesterol fill the arteries with fatty deposits which lead to lesser blood supply to the heart that can cause a stroke/ attack. Prevention is better than cure. Lowering every one percent of cholesterol level in blood reduces the risk of heart attack by two percent. It is good for health conscious people. 12 months for RT & Tin. 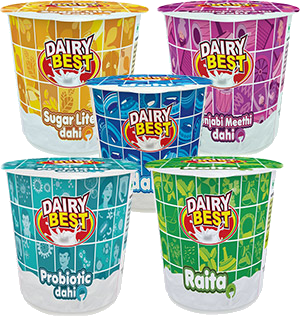 Dairy Best Milk has added vital minerals and vitamins. Compared to just milk, Dairy Best Milk has extra vitamin A & D.
It also contains Vitamin B2 for releasing the body’s energy and Vitamin B12 for blood formation and healthy growth. Thus promises for a stronger bone development in the formative years, better muscle strength and a tougher immune system, in short a strong foundation for life, of your child. 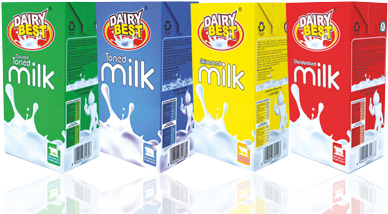 UHT Milk has all the nutritional values of regular milk but with added shelf life of almost 6 months. 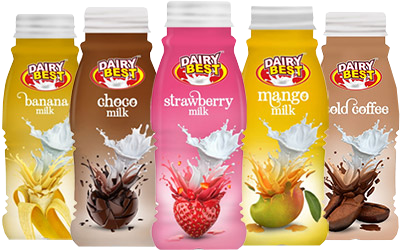 Flavoured milk is a nutrient-rich milk-based beverage produced exclusively from highest quality of fresh milk under utmost hygienic conditions using the latest & modern equipments. 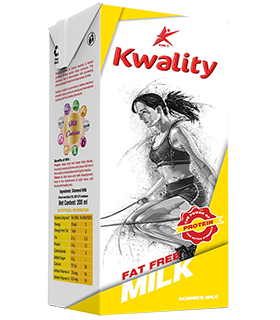 It is palatable & refreshing drink yet nutritious providing calcium, potassium, phosphorus, magnesium, vitamins & body building proteins. Protein is necessary to build muscles while calcium & phosphorus along with vitamin D help to build & strengthen teeth & bones. 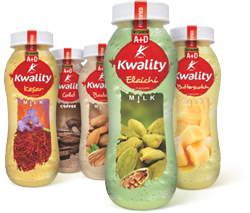 It comes in many exotic flavours like, Strawberry, Banana, Butterscotch, Mango, Elaichi, Cold Coffee, Chocolate milk, Kesar, Rose, etc. 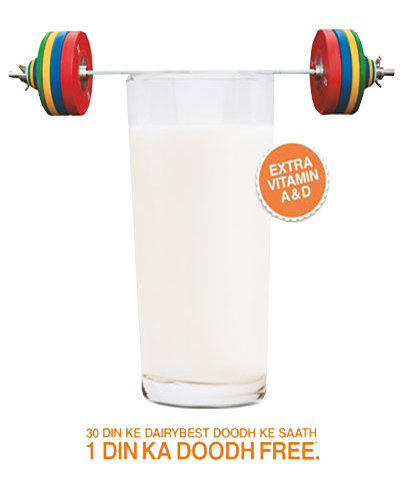 Made from 100% pure high quality toned cow’s milk, it has all the goodness of natural calcium. 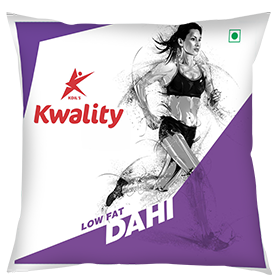 It is thick, consistent dahi, that's really delicious and easy to digest. 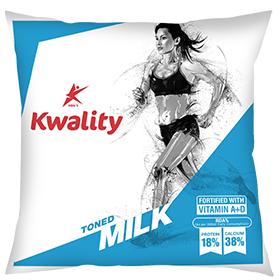 Kwality Ltd.’s fresh and soft Paneer (cottage cheese) is another pure product made from fresh milk. 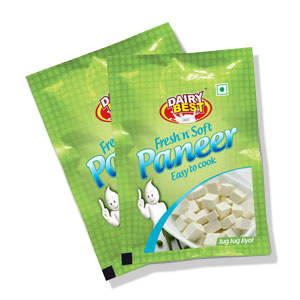 This traditional milk product is used all over the country in different forms-eat it raw or cooked, paneer is a hot favourite in every household. 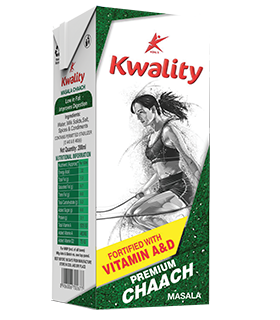 In line with providing customers with the best, Kwality ensures that the paneer we produce is of best quality. Sprinkle a few strawberries, diced peaches, chopped banana, or pineapple chunks on the top of cottage cheese. It can be eaten as a dessert or just as a good healthy breakfast! 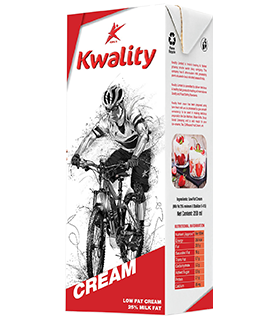 White Salted Butter - It is a revolutionary product from Kwality Ltd and has made its debut for the first time in India. White salted butter is made from clean and wholesome cream derived from 100% cow’s pure milk. Contains no preservatives or added flavors. 100 gm and 500 gm packs. 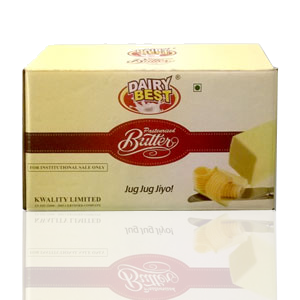 Traditional Yellow Butter Yellow butter is made from clean and wholesome cream derived from 100% cow’s pure milk. Contains no preservatives or added flavors. 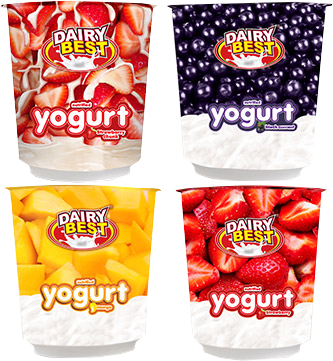 Yoghurt is nutritionally rich in protein, calcium, riboflavin, vitamin B6 and vitamin B12. It has nutritional benefits beyond those of milk. It is produced by bacterial fermentation of milk. Prepared with chunks of fruits it is considered a good source of digestion. Contains milk solids, milk fat sucrose, and emulsifiers. 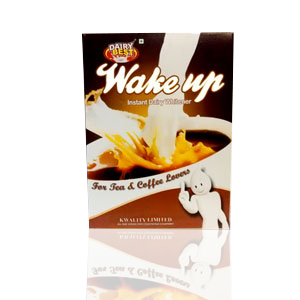 It is appropriate for making, milk, tea, coffee, curd, lassi, mishthi doi, milk shake, ice cream, pudding and sweets. India has a population of more than 1 billion with diverse food habits, cultures, traditions, and religions. History of ghee dates back to as early as 1500 B.C. in ancient India. Ancient Sanskrit literature describes ghee as “food fit for God” and a commodity of enormous value. Color: White or light cream Texture: Uniform, granular, free flowing, lump free. 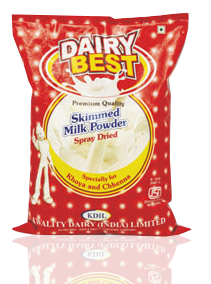 Skimmed Milk Powder is made from fresh full fat milk and is completely free from artificial flavors and colors. It can be used for making milk, tea, coffee, curd, lassi, mishthi doi, milk shake, ice cream, pudding and sweets. It has 1.5 % less fat content and has no added colours. 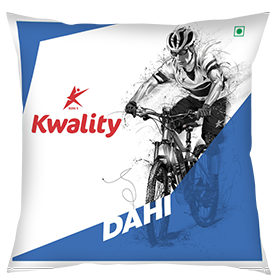 500 gm and 1 kg laminated pack. One serving of milk is equal to one cup. The nutritional breakdown of milk depends on the fat content. 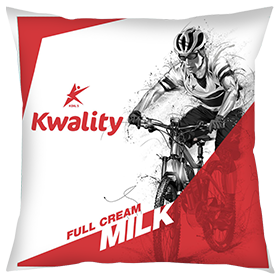 Whole milk, with 3.25% fat contains 146 calories, 8 grams of fat, 13 grams of carbohydrate and 8 grams of protein in one cup. 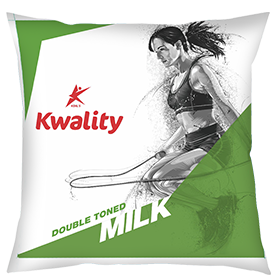 One cup of skim milk has about 86 calories, 0 grams of fat, 12 grams of carbohydrate and 8 grams of protein. Calcium: Dairy products like milk are the best dietary sources of calcium. Calcium has many functions in the body but its primary job is the development and maintenance of healthy bones and teeth. Calcium is an important part of the blood clotting and wound healing process. It is important to try to pair calcium-rich foods with a source of vitamin D, as vitamin D helps the small intestine to absorb calcium. There are 306 milligrams of calcium in one cup of skim milk. Choline: Milk is also one of the best sources of choline; an important nutrient found that helps with sleep, muscle movement, learning and memory. Choline helps to maintain the structure of cellular membranes, aids in the transmission of nerve impulses, assists in the absorption of fat and reduces chronic inflammation. Potassium: High potassium intakes are also associated with a reduced risk of stroke, heart disease, high blood pressure, protection against loss of muscle mass, preservation of bone mineral density and reduction in the formation of kidney stones. A potassium-rich diet ensures a 20% lower risk of dying from all the causes. The recommended daily intake of potassium for all adults is 4700 mg per day. Vitamin D (fortified): Vitamin D is important for bone health, aiding in the formation, growth, and repair of bones. Vitamin D also plays an important role in calcium absorption and immune function. Vitamin D deficiency has been associated with osteoporosis, depression, chronic fatigue, muscle pain, PMS, hypertension, and breast and colon cancer. Milk also provides magnesium, phosphorus, vitamins A, riboflavin, vitamin B-6 and vitamin B-12.